To Charles Allman, the train he got for Christmas was just a toy: Something to vroom, something to enjoy, and—let’s be honest—something to chew on. After all, he’s only 1 year old. Charles doesn’t yet know the role that train has played in the story of his family, their town, and his future. To his parents, Ken and Julie Allman, the stories of trains go deep. They represent history that needs to be preserved, a tool to bring visitors, and great potential for Hinton, a town 10 miles off I-64 but right on the tracks. But the trains are just one key to Hinton’s future. There are three features that have helped shape the town’s past and future, and a revitalization that’s increasingly being recognized both here in West Virginia and for the nation as a whole. Those features—the trains, the rivers and the town—all have a place in Ken Allman’s vision for Hinton. His is a vision shared among the town’s leaders, residents, and those who travel in for work or play. The vision is this: a small railroad town revitalized. A destination attractive not only for locals, but for visitors throughout the region and beyond. A home where people will enjoy living. A town already rich in history, nature and architecture that can come alive once more. A Historic District that serves as both an attraction and a model for others. That vision is being realized in Hinton today. First, the trains. The Chesapeake & Ohio Railroad brought Hinton a golden age. The town was founded in 1872 to serve the needs of railroaders, and in return, the railroad brought jobs, visitors and infrastructure to Hinton. Trains factored into Allman’s life even before he was born. His dad, Ken Sr., was born in Pocahontas County, grew up in Ronceverte and first left home to serve the country in Korea. After his return, it was off to college for two years at what’s now Concord University. College prepared Ken Sr. for his next job, where he worked at an investment firm in Washington, D.C., in a building that still stands in view of the White House. He and his new wife, Rosemary, spent a short time living in Arlington, Virginia, until homesickness struck. The Allmans decided to return to Southern West Virginia and chose Rosemary’s hometown of Hinton for home. Once back in Southern West Virginia, Ken Sr. turned to the railroad. There was family precedent; his four brothers worked for the trains as well. He became a brakeman conductor on the C&O. For the Allmans—and for many other railroad families before and after—that meant work often took Ken Sr. away from home. Rosemary was a supportive spouse. While Ken Sr. worked on the rails, she worked in town as a maintenance operator for the phone company until Allman—he’s “Little Kenny” here—was born. It was in town that she also raised Allman and his sister, Sheila, in a little house on 12th Avenue in Hinton’s West End neighborhood. That house isn’t far from the railroad depot that even today factors into the fabric of Hinton. The C&O Railroad built in 1905 down by the tracks along the river is still in service. It serves more than 8,000 riders each year on the Amtrak Cardinal and stops for riders three days a week. Federal grants and matching city funds are helping the Passenger and Freight Depots get a facelift: fixed windows, new slate roofs, restored wood and brick work and more. The depot is also the welcoming point for the stream of thousands that visit each fall during Hinton Railroad Days, a train-based tour of the New River Gorge that draws thousands of visitors up and through the town each year to enjoy the street festival that’s part of this town’s vision realized. During Railroad Days, local businesses and street vendors hold sidewalk sales. Restaurants are packed, and civic groups prepare festival food favorites outside. Throughout the year there are other festivals, such as the WV State Water Festival and the Festival of the Rivers, fishing tournaments and power boat races. There are parades, there are bands, and the events help bring the tourists that are part of the dream. Throughout the town, the rails hug the New and Greenbrier rivers, stretching north up to the Gauley and the Kanawha, and east through the Big Bend tunnel made famous by the legend of Steel Drivin’ Man John Henry. Hinton sits at the confluence of the Greenbrier, New and Bluestone rivers—a dramatic scenic backdrop to the town’s natural and restored beauty. Travel along the New River on WV State Route 20 and over the bridge, and you’ll find yourself in the third key to both Hinton’s past and its future: the Hinton Historic District, listed on the National Register of Historic Places. It’s in the Hinton Historic District where the revitalization of the town is clearest. And it’s here where Ken’s role in the vision comes to life. The town is where he grew up, and for Allman, Hinton will always be home. Perhaps that’s why he’s committed to the town’s vision even though the last time he lived there full-time, he was in college. After graduating from Alderson Broaddus and a short time of post-grad work at the University of Dayton, Allman headed to life in the big city of St. Louis and found success working first as a management consultant for companies in a variety of different industries throughout the country, and then as a consultant for a physician search firm. Then, Ken Sr. got sick. Cancer, they said. And he didn’t have much time left. So Allman headed back home to Hinton. His plan was to navigate both, to work for the physician search firm from West Virginia while helping take care of his dad. But after a few weeks of trying to balance the needs of his family with work from afar, he resigned. He’d focus on his family and find work again in St. Louis later. Allman and his sister, Sheila, and mom, Rosemary, helped Ken Sr. through his final months. And throughout that time, Allman refocused his approach and rethought his plan. The new plan was this: He’d return to St. Louis, but this time start a business of his own. He’d draw on his experiences from management consulting and the physician search firm and collect and distribute physician recruitment information to hospitals and medical groups. He hired a staff, sublet an office, and grew the company. But it all happened too fast, and something had to change. After his first year in business, he pulled everything back—staff, space and services—and moved the business back into his apartment to operate as a one-man show. In the meantime, the Internet came about, and Allman’s plan took shape on the new World Wide Web. Over the next few years, the business began to grow, this time more manageably and intentionally. It was time to expand once more, with staff, space and services. But the big-city prices of St. Louis weren’t conducive to a bootstrap operation of limited means. So back to Hinton he went, to launch the headquarters of PracticeLink.com. “Moving the business to Hinton was out of necessity. Being able to hire family members and other people in the community allowed the business to continue to grow in a way that wouldn’t have been possible for me in St. Louis,” Allman says. “It allowed me time, and a low-cost overhead to learn from my mistakes.” Hinton gave Allman and PracticeLink a home base in a place that felt like home. Now, more than 20 years later, PracticeLink is considered the leader in the physician recruitment industry. More than 5,000 hospitals, medical groups and other health care facilities use PracticeLink to recruit and hire physicians, nurse practitioners and physician assistants they need in order to staff their organizations and help heal their communities. More than 20,000 job-seekers register with PracticeLink each year in order to find a new practice in the communities that need them most. PracticeLink helps those who help others. Now, Allman’s employees span offices in five states, with more than 60 based in Hinton between PracticeLink and MountainPlex. And still, Hinton is home, using technology to serve the needs of health care organizations throughout the country and around the world. Allman’s gratitude of that support has helped fuel his unwavering commitment to helping Hinton realize its potential. The first restoration project was Rosemary’s childhood home, which he renovated to become a more comfortable home base for the family. Then it was onto business. In order for both PracticeLink and Hinton to grow, the town needed some basics: a place to stay in the historic district. A place to eat within walking distance. Entertainment options. With these goals in mind, Allman founded MountainPlex, the company and the teams that would help execute the vision. An important part of the team is Allman’s wife, Julie, who ran her own successful interior design firm in St. Louis for more than a decade. The most pressing need Allman saw was the need for lodging near the PracticeLink office. That launched the renovation and establishment of what is now The Guest House Inn. It’s a 5-star Trip Advisor rated non-hosted bed and breakfast decked out top to bottom in Restoration Hardware. The Guest House courtyard, lined with a hibiscus hedge and a 90-foot mural by Tom Acosta, hosts barbeques, receptions and other events. The Magnolia Room Conference Center—conveniently located right next to The Guest House Inn—is the perfect place to hold a small business meeting or reception. And throughout the years, additional adjacent properties, such as the Townhouse and the Parker House, have also been renovated to accommodate larger overnight groups. The Guest House Inn’s recently renovated Cabin on Coney Island was named one of West Virginia’s “Most Unique Places to Spend the Night.” Accessible only by water, the cabin sits facing downstream where the New and the Greenbrier rivers meet. Once there was a place for visiting professionals to stay close to PracticeLink HQ, there needed to be a place for staff, residents and visitors to eat. 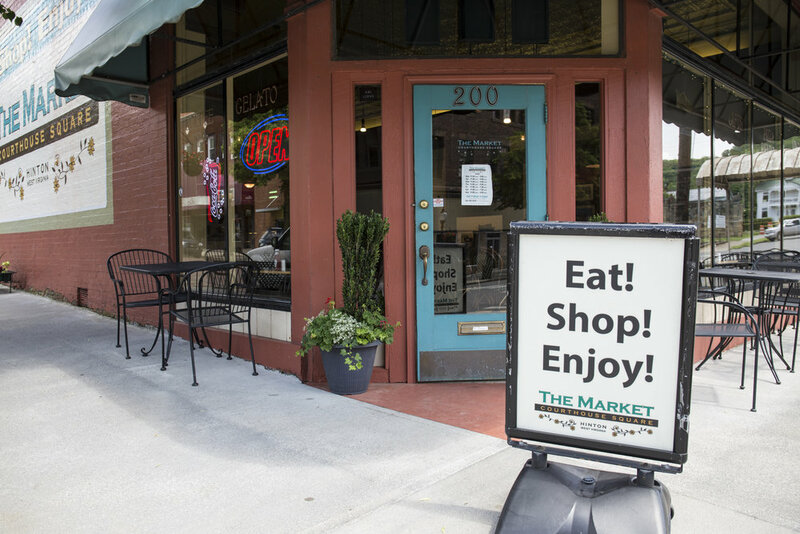 The Market on Courthouse Square, just doors down from both the office and the Guest House, has become a favorite spot for locals and visitors. Flame-grilled burgers, fresh sandwiches, tempting homemade desserts and wine and local microbrews are served in a charming corner café, its walls lined with specialty gifts. A gourmet brick oven turns out specialty pizzas all day. In late 2016, another restaurant was launched in the Hinton Historic District: Chessies on the Square, a nod to the C&O in both name and décor. Chessies is an upscale dinner spot featuring a unique twist on traditional Appalachian favorites. The full-wall mural in the dining room features historical photos of Hinton and the trains in their heyday. After dinner, guests can walk across the street to The Ritz Theatre – Cinema & Performing Arts. This historical building from 1929 has been restored into a digital theater showing first-run movies Friday through Monday without the need to travel to a larger city for a show. Primetime tickets range from just $4 to $6, and concessions are available without breaking a family’s budget. All the while, you might be listening to radioAM1380, Historic Hinton’s Hometown Radio, which broadcasts music and covers topics of local interest. Or maybe you’ll catch coverage of the game on ESPN 102.3 The Ticket, studios for both of which are headquartered above The Ritz. At the center of the Historic District is Hinton’s version of a skyscraper: the 5-story Hotel McCreery. In Hinton’s heyday, the McCreery was a cutting-edge centerpiece for the town. And today, it has the chance to be so again. 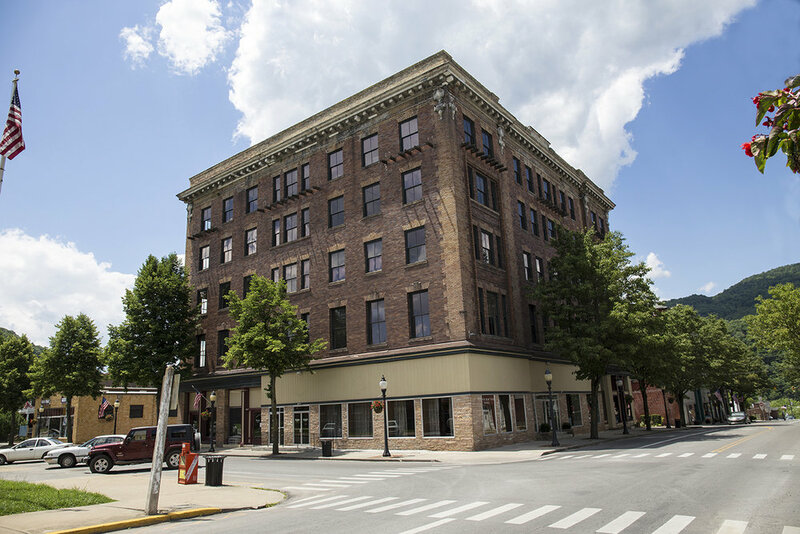 Allman and his team secured grant assistance and worked to repair the roof, restore more than 200 windows, and refinish the hotel’s original mosaic tile floors and pressed-tin ceilings. 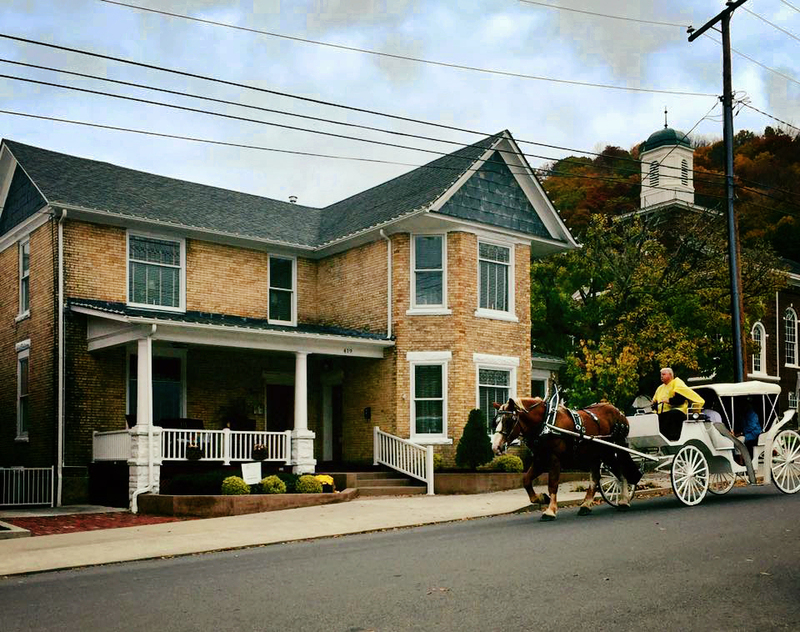 The efforts have turned the McCreery from one of the Preservation Alliance of West Virginia’s list of most endangered properties to an upscale banquet and event facility. Down the street from the McCreery, guests shop at Otter & Oak, the outfitter that carries gifts, clothing and supplies for travelers and residents alike. Upstairs, local artists display their creations for both visitors and for sale in the Rivertown Gallery. Downtown Hinton is a very walkable community. Many small businesses, restaurants, boutiques, banks, insurance agents, attorneys, flower and antique shops, drugstores, the public library, an art gallery and two museums all call the Hinton Historic District home. So do the beautiful and unique turn-of-the-century homes that line the original cobblestone brick side streets. “The community, government, civic leaders and Hinton’s home-owned small businesses have been very supportive of our efforts, and we greatly appreciate theirs,” Allman says. The work in Hinton hasn’t gone unnoticed. Allman was the WV Small-Business Person of the Year in 2013 and was recognized by Who’s Who in West Virginia Business in 2009. Most recently, Allman was featured as an Influential West Virginian by West Virginia Public Radio in December 2016. The work in Hinton is promising, but the work isn’t done. Across the street from both the McCreery and The Market, work is underway on The Rivertown Inn, which will feature 12 boutique hotel suites. The Rivertown Inn will be anchored by Heritage Plaza, featuring a second Tom Acosta mural, outdoor stage and water feature. “It is our hope that Hinton becomes recognized alongside Fayetteville and Lewisburg as a place where people want to relax and enjoy themselves,” Allman says. Its easy access helps. With I-77 30 minutes to the south and I-64 15 minutes to the north, the town’s within a 30- to 45-minute drive from southern West Virginia’s most prosperous commercial centers. Whether you arrive by the trains, play in the rivers or stay for the town, there’s an exciting current running through Hinton. It’s a place that will welcome you home—one where the vision is focused on a promising and attractive future. A beautiful place with big plans. The town of White Sulphur Springs is working to grow and expand its Main Street to bring in more people and more businesses. A devoted group of stakeholders is ready to enhance Main Street and realize its full potential. West Virginia is, dare we say it, becoming cool to the outside world.